Models of the prom fashion show dance in the background with senior Emily Gifford. Dinner and a show involves a dinner and talent show where students have the opportunity to showcase their talent while simultaneously raising money for After Prom. The show provides a creative outlet for students and allows them to share something special. It allows students to model clothes, provided by American Commodore Tuxedo, and to raise money for After Prom, as well. Dinner and a show took place for the 3rd year on November 30 and students of all ages performed. This year students sang, danced, and one performed magic. Lead coordinator Bunny Oldham described what dinner and a show is and where proceeds go to. She also mentioned it was catered by Smoke the Burger Joint this year and featured acts were performed by various students. “Dinner and a Show is a fundraiser to raise money for After Prom which provides the Revere seniors and their dates a safe alternative to be together After Prom. Dinner is catered this year by Smoke the Burger Joint, . . . a sister company to Old Carolina BBQ, which has sponsored dinner for the last two years. The show is a cabaret style show, comprised of talented kids from all four buildings in the district,” Oldham said. Oldham also explained how the winner is selected, and mentioned that this year Broadway star Seth Stewart assisted as guest judge. Oldham also mentioned that Stewart is most well known for his role in the Broadway show Hamilton as Lafayette/Jefferson. “There is a People’s Choice Trophy that is awarded to the performer who raises the most money for their act, collected in jars before and during the show. This year, the winner of the trophy will be selected by crowd vote, amount of money raised and vote by guest Judge Seth Stewart,” Oldham said. Oldham talked about what the winner of the show receives, besides the trophy awarded. “The winner will also be invited to be a special guest of Seth Stewarts MasterClass to be held December 4th,” Oldham said. Oldham talked about who performed and mentioned that ETC will perform again. Oldham also stated that Emily Gifford and students from room 239 will perform this year. 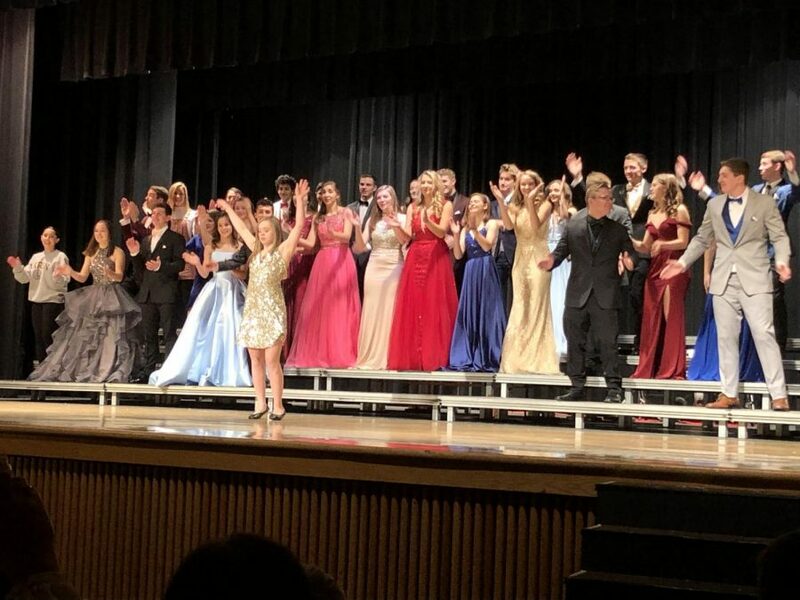 “ETC All American Show Choir, a community show choir comprised of fifty plus students from fourteen different schools, is the anchor act of the show, for the 3rd time. Also performing this year will be the Revere trombone guillotines featuring the Sousaphone Section. Also involved for the last two years, is Emily Gifford. This year, Emily will be performing with her friends from room 239. They will be performing a number from Hamilton,” Oldham said. Oldham also discussed who will model the Prom clothing provided by American Commodore Tuxedo. “This years models include Seniors from various organizations that represented Revere in state competitions and district champions. Models include Amy Lazbin, who went to State Finals in tennis, the Seniors of the Men’s soccer team, members of the Revere band, representatives of the Girl’s soccer team, Girls volleyball team and other student leaders,” Oldham said. Store manager of American Commodore Tuxedos and Dresses, Vanessa Inman discusses how the styles that students model are picked. Inman also mentioned that all the dresses are available to purchase and the tuxedos are available to rent. “We pick the styles for the student models to wear based on current inventory and by what is popular trending styles,” Inman said. Senior Josh Devera has competed in the show for the last two years and has won both years. He showcases a style of dance called animation dancing. Devera described what animation dancing is and explained how it differs from other types of dance and is more of a risk, due to the dance being a freestyle. Devera also explained how he practices. “The style of dance I do revolves around freestyle dancing and being able to master the song you are dancing to with your moves. The best way I have found to practice is to make sure I know the song I am dancing to like the back of my hand. I will usually go into a performance with a few ideas in mind, but everytime I perform it is a freestyle. The best part about freestyling is you never know what is going to happen. You can create something special on stage at the risk of messing up your performance,” Devera said. Devera talked about how winning the show feels and explained how winning in the past motivates him and helps him to assemble a better performance. Devera also explained what he hoped to accomplish with his performance this year. “Winning the show is very exciting. It is something I always wanted to accomplish, but I never thought that I would be able to pull it off. Knowing that I am able to win drives and motivates me to assemble the best performance that I can. This year I hope to intrance the audience with my dancing and also tell a story. I have been experimenting and I am super excited for everyone to see what I have been planning this year,” Devera said. Devera explained how dancing allows a creative outlet for him and also touched on trying new things, as he did with dancing. “This year has been very opportunistic for me and it has allowed for me to be creative in many different ways. I try to take something from everything I do and put it into something else. 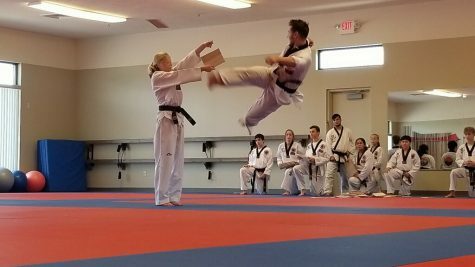 You never know what you can learn from trying something new, and it could lead to an opportunity in the future,” Devera said. Devera mentioned his favorite part of the show and explained how the hardwork from the people involved helps to shape the show and add special elements. Devera also added what the most fun part of the show for him is based on his performance. “My favorite part about the is the creativity and involvement. Everyone works hard to make the show the best that it can be, and the performers are able to shape and design exactly how they wish their performance to play out. The most fun part about the show is being able to create an experience that mesmerizes and amazes the audience,” Devera said. All proceeds from the show went towards After Prom and any senior who participated will be able to purchase their After Prom ticket for half off. Freshman Ellie Lewis performed a song and won the competition this year.